Dwight, Bentel & Hall Communications students with Chevrolet representatives and the new Chevrolet Cruze. 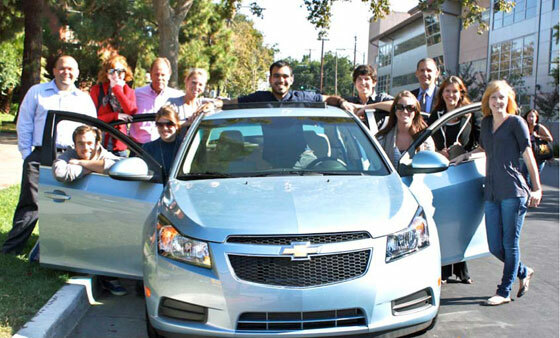 A team of eight San Jose State students earned national honors for their marketing plan to help increase student interest in Chevrolet cars. The team’s inventive marketing techniques earned the top score in a competition involving 23 colleges nationwide. Prizes included a new laptop for each SJSU team member. Part of the marketing plan for the auto manufacturer included a chalking campaign where the team chalked a teaser message, “Where You Going?” on campus sidewalks, along with the link to a Facebook page for student interaction. The group also placed fake car keys around campus with codes that drove people to the Chevrolet and promoted “The Going Gets Easy” event, where cars were brought to San Jose State for students to check out. 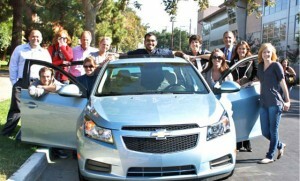 The team represented SJSU in the competition as part of the Chevrolet Campus Promotions Program. The program gives students real-life experience in marketing on a limited budget, while also increasing awareness and influencing car buying decisions for the Chevrolet brand. Each team was given $3,000 and had only a few months to research, implement and evaluate an integrated marketing communications campaign that would grab the attention of their peers. “Being recognized for our hard work is more rewarding than any prize we could’ve received,” said SJSU student Juan Luna. “Having competed against 22 other schools, and winning reassures us that we are capable of taking on real-life clients.” Luna and the other seven members of the winning team are also part of San Jose State’s Dwight, Bentel & Hall Communications, a student-run advertising and public relations agency. SJSU student Ashley Albert is a public relations specialist at Dwight, Bentel & Hall Communications.